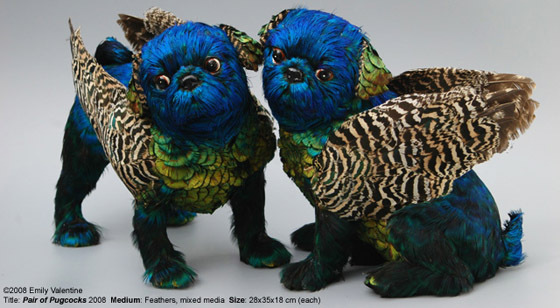 You know, every time I think that there could not possibly be one more piece of taxidermy in the art world and that the trend is, ahem, totally dead, something new pops up and makes me rethink the whole ordeal. 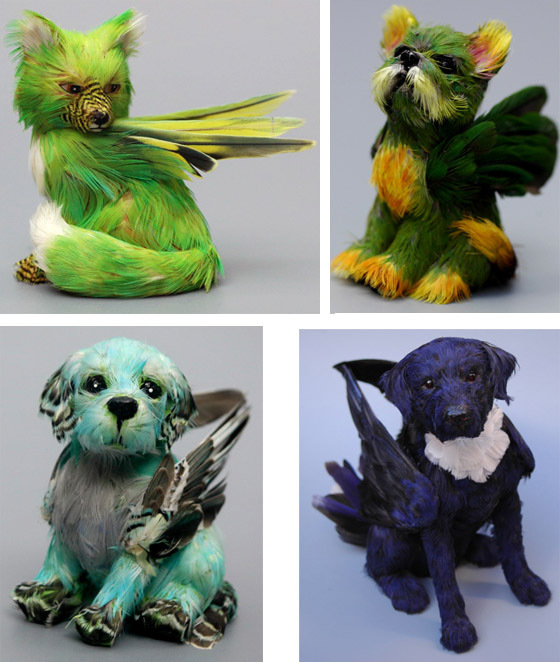 Emily Valentine uses the feathers from road kill, cat kill and lost pets to create these super-saturated pet pups. I love their vibrant colors and the fact that each one has it's own sweet little expression. Here is Valentine with her work, isn't it crazy how tiny they are? Recently, Valentine has been (cover your eyes!) trapping and killing the Mynah bird, which is a registered pest in Australia. From what I've read, it sounds like she's doing good, and starting a dialogue through her work about animals and waste and pests and non pests and so forth. But I really can't get past the fact that she kills them. Bugs are pests, but I still politely shuttle them outside when they land in my house. I know we have a few readers down under, what do you think about this Mynah bird? For the rest of you, don't you think those puppies are adorable?